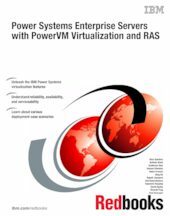 This IBM® Redbooks® publication illustrates implementation, testing, and helpful scenarios with IBM Power® Systems 780 and 795 using the comprehensive set of the Power virtualization features. We focus on the Power Systems functional improvements, in particular, highlighting the reliability, availability, and serviceability (RAS) features of the enterprise servers. This document highlights IBM Power Systems Enterprise Server features, such as system scalability, virtualization features, and logical partitioning among others. This book provides a documented deployment model for Power 780 and Power 795 within a virtualized environment, which allows clients to plan a foundation for exploiting and using the latest features of the IBM Power Systems Enterprise Servers. The target audience for this book includes technical professionals (IT consultants, technical support staff, IT Architects, and IT Specialists) responsible for providing IBM Power Systems solutions and support.